Comprehensive Return to Work programs can be effective in containing and reducing the cost of workers’ compensation as well as improving employee morale and compelling employees to participate in an active recovery. The program benefits employers by reducing fraudulent claims, receiving some production for wages paid, it facilitates employer/employee contact as well as saves the cost of hiring and training replacement employees. Benefits of the program for employees include a reduction of the negative financial impact many injured workers experience due to lost time, the ability to maintain social contact with fellow co-workers, increases self-esteem by minimizing feelings of guilt for having been injured and contributes to a faster recovery by keeping the injured employee mentally and physically conditioned to the regular work schedule. 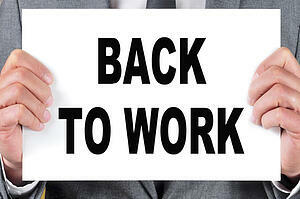 An effective Return to Work program is designed to facilitate the earliest possible return of injured workers to the workplace, to perform meaningful, productive work within their physical capabilities. The program can also be referred to as being Modified Duty, Light Duty, Limited Duty, Restricted Duty or Transitional Work and it is intended to be time-limited and temporary. Getting injured employees back to work benefits your company by reducing your workers compensation costs and improving employee morale.